Pakistan is in a state of utter confusion. Our people are uncertain as to who is running the affairs of the country. Is the government even capable of maintaining its writ over the citizens, or are certain groups powerful enough to challenge the state at will and without repercussion? These questions came to light as a result of the recent sit-ins by Tehreek-e-Labbaik Ya Rasool Allah (TLYR) in Islamabad, Lahore and Karachi that virtually brought the entire country to a halt. 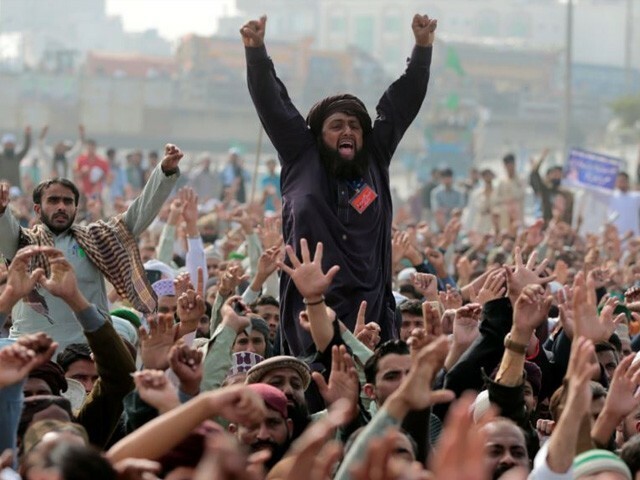 As far as religious parties go, Pakistani voters have never seen them as serious contenders to represent the people in the echelons of government. If anything, the right-wingers have been deemed as mere hopeful participants in the election process, who everyone knows are not capable of winning. But that does not seem to be the case anymore. The events of last week were a stark wake up call for how far the right-wing parties have come. An example of the rise of the right was showcased aptly in the outcome of the NA-120 by-election in Lahore a couple of months back. Considered to be an impregnable fortress of Pakistan Muslim League-Nawaz (PML-N), the political pundits were shocked when religious parties were able to win the third and fourth largest seats. Could this be the result of a continuous cycle of disillusionment against the ruling political elite, or an outcome of the state’s incessant patronage of the right? The answer, as with all difficult things, lies somewhere in the middle. Right-leaning ideological groups have been used in the past as a counterweight to defeat national mainstream parties. Our history was a witness to this travesty, when in 1988, religious parties were huddled together in the form of an alliance, and along with politically irrelevant individuals such as Altaf Hussain and Nawaz Sharif, this alliance was heavily funded and supported. It was done just to counter the Pakistan Peoples Party (PPP), by breaking and dividing their vote bank. The results of this misplaced fear of a nationally powerful democratic party led to introducing right-wing factions into the political limelight. It also directly resulted in the systematic destruction of Pakistan’s main economic artery – the “city of lights”, where one party’s deliberate ethnic-based hate politics fanned the flames of unrest, which ran unchecked for decades, and body bags became the unfortunate norm. This nonsensical approach of Ziaul Haq also led to the woeful demise of left-wing politics. In the 70s, Pakistan, under the charismatic leadership of Zulfiqar Ali Bhutto, prospered as a nation that found strength in its diversity. Pakistanis of all religious and ethnic backgrounds, both religious and liberals alike, followed a “live and let live” way of living. The hanging of Bhutto and the subsequent rule of Zia were events of such tragic proportions, which till date haunt our nation. It sounded the death-kneel of a progressive, inclusive and democratic Pakistan, and turned us into an anarchic nation that was not even sure about its ideology. Those who tried to speak up were ‘silenced’, or were forced to leave the country. Intellectual giants, such as Faiz and Habib Jalib, were labelled as communists for raising their voices against the brutal regime. Art and cultural activities were discouraged and the nation drowned in an ocean of fear and repression. But the years of Zia did not simply embolden right-wing politics; it created societal fault lines so deep that the class divide became impossible to bridge. The educated elite, which till then were participants in running the government through the bureaucracy and by participating in national politics, became so dismayed at the state of affairs that it chose to alienate itself from government altogether. The educated class either moved aboard or chose private professions. This left the field wide open for incompetent and corrupt figures to enter the official domain and with rampant top to bottom corruption, it led to a total ruin of state institutions. On the other hand, people belonging to the underprivileged classes, witnessing the evasive lack of justice, fairness and merit in a system that constantly failed them, chose to use religion as a means of attaining a political clout in society. With limited knowledge of the faith, they became the ‘protectors’ of the religion. Each group had its own set of ardent followers, marked by the distinct colour of their turbans. Each called itself right and all the rest wrong. This is how religion was used as a means to do petty politics and gain power. The recent news of some members of PML-N resigning from the party and joining the ranks of Tehreek-e-Labbaik Pakistan (TLP) is a red flag that we cannot afford to miss. Are we seeing yet another right-wing alliance being orchestrated, to defeat a national democratic party? If that is indeed the case, history shows that extremism will prosper, and Pakistan will be the inevitable sufferer. The author hails from Lahore and is a lawyer by profession. He recently graduated with a Masters in Law from the University of California, Berkeley. In the absence of proper governance, is Chief Justice Saqib Nisar Pakistan’s ‘saviour’? Why are Pakistanis obsessed with finding that ONE Superman who will clean up this mess?? ?